I'm behind on everyones blogs and apologize. I spend half the day working and the other have just being lethargic. When I have time to catch up I just don't seem to get around to it. Who knew that being all belly would be this hard? Anyday now I am waiting to wake up and see my feet, face and hands swollen and my feet to have grown a size...but so far I have been safe. You can't hate a boy in Polo. And did someone say Burberry? I must thank Patty for opening her home and hosting the shower. It could not have gone any better had I planned it myself, so thanks girlfriend! Thank you also, to all who showed, it really meant a lot to me! You see what I mean right? Hubby will be able to tote baby Boy around in one hand no problem!! 32 weeks is coming up on Thursday...8 months...woot-woot. You're on the homestretch, not too much longer now. 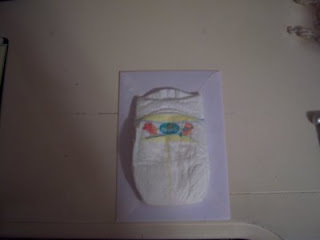 And yes, those newborn and size 1 diapers are itty bitty!! The shower was fun and it was so great seeing you after all this time! OK I love the picture with YOUR Husbands hand comparing the diaper...YOUR baby BOOK is going to be SO GREAT with all this in it...RIGHT...YOU are so putting this all in the book for BABY BOY! Your Shower LOOKED like so much FUN! Oooo I am so excited for YOU!!!! What cute outfits!! Baby showers are SO fun!!! Yeah... at some point you'll look back at that picture and say "there is NO WAY he ever fit in those"
Wow...32 weeks. The final stretch! I thought the exact same thing with the newborn diaper samples that would come in the mail. They looked tiny until Baby arrived, then they looked huge... and she was NOT a small baby, 8+ lbs. Now I see the newborn dipes and think, was she EVER that small??? I also thought all of the newborn clothes were sooo small so I didn't buy any. 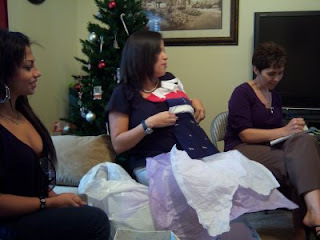 Thank goodness people love to give clothing as gifts or I would have had a nekkid baby! It just seems impossible for someone to be so tiny. Then when she was out and people would remark on how tiny she was I would always think to myself, "are you kidding, she is huge!" I guess they fill up your heart so much, they seem enourmous. By the way, you look beautiful in the pictures! Happy home stretch!! I love those tiny tiny diapers! Audrey was 9lbs 10 oz, and she actually wore them for a couple of weeks before moving onto size 1. SO cute. Looking back now, I can't believe she was ever so tiny. Getting so excited for you, can't believe time has gone so fast. 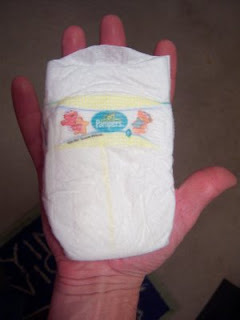 What a tiny little diaper. I hope you played lots of baby shower games at your shower. I always have so much fun playing those games.